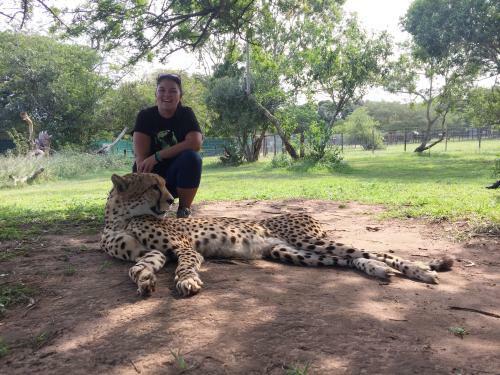 Young Territorian and IHD Resident, Muriel Scholz spent three weeks in Southern Africa as part of the Volunteer Eco Students Abroad (VESA) program over the summer break. 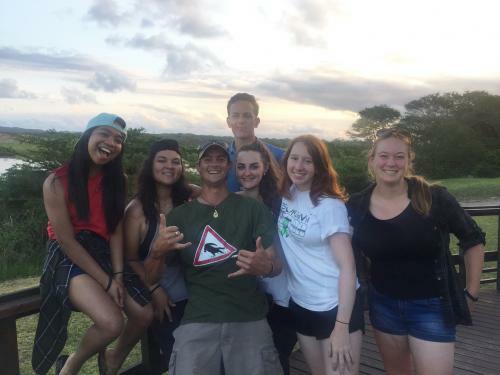 Once all 55 volunteers arrived in St Lucia to begin the program, they split into three smaller teams. On Day 2 the volunteers were provided with the opportunity to work with the local children; working through a lesson plan which incorporated interactive games with literacy and numeracy. The group would spend another afternoon at Mama Doris’, where Muriel counted well over 100 children running throughout the home. Muriel managed some up-close-and-personal experiences with the resident wildlife over Days 3 and 4. At the Emdoneni Cheetah Park, the group cleaned troughs and cleared weeds amongst the African wildcats, servals, caracals and cheetahs. A trip to The Crocodile Centre started out as a normal tour, but soon became an adrenalin rush for the then 19-year-old. “The next thing I know, we’re jumping into an enclosure with six massive crocs and hacking at fallen trees and removing debris, all the while these living dinosaurs bathed a mere 25 metres away,” she said. It would seem as though no matter where Muriel goes, there’s sure to be crocs! "Volunteering is something that can network you with people from all over the globe...and if you do have the means then why not?" From Day 5, Muriel and her team started their phase of construction on the Khula Village site. The site’s construction component was to build a new home for a single mother of nine children. “The previous two groups had dug and laid all the foundations earlier that week, [which] left us to begin building the walls,” she explained. “We spent two days stacking bricks up past our heads, mixing cement, unloading endless amounts of bricks, digging a huge septic tank hole (and watching the sides cave in), playing with the kids, and throwing the occasional cement ball. Once the hard work had been completed, it was time for the groups to enjoy the culture and surrounds of South Africa. Much to Muriel’s anticipation, she’d heard of hippos frequently wandering the local streets. However, rather than stumbling across a hippo on a night out, she had to wait until a safari cruise to spot one. With all the trip’s highlights, there were sure to be some minor hiccups to add to the experience. The group’s bus was stranded on the side of the road with a flat tyre for four hours and their speed boats would cut-out in the middle of nowhere. “But I wouldn’t really say these were challenging, they just all came together to make one hell of an experience,” she said. Since being back in Darwin, Muriel’s reflected on her overseas experience and is eager to get involved in local community projects. “Everything has an impact,” Muriel said. “This trip, it had an impact on me, on the other volunteers, the tour leaders, the locals, the community, the VESA team, everyone involved. As well as personal growth, Muriel feels the shared experiences with the team and having the chance to listen to the local mothers, fathers and children on how they lived, made the efforts of fundraising and brick-laying more rewarding. 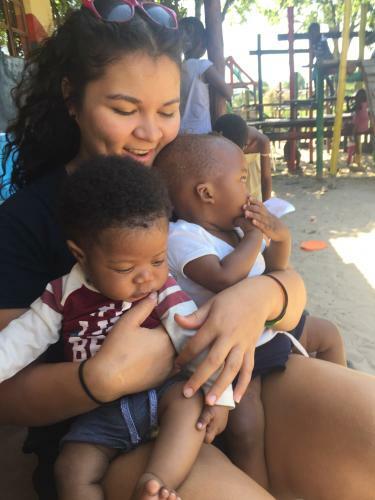 For students looking to volunteer abroad, Muriel says “go for it”. “You get to experience so many things you would never have even considered,” she said. “You’ll learn new things and make new memories to cherish. You can read Muriel's story prior to her trip here.